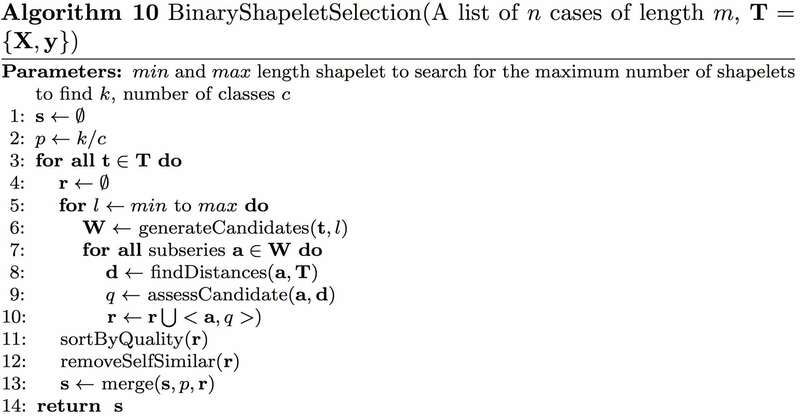 Description: Hills $et\:al.$ propose a shapelet transformation that separates the shapelet discovery from the classifier by finding the top $k$ shapelets on a single run (in contrast to the decision tree, which searches for the best shapelet at each node). The shapelets are used to transform the data, where each attribute in the new dataset represents the distance of a series to one of the shapelets. We use the most recent version of this transform that balances the number of shapelets per class and evaluates each shapelet on how well it discriminates just one class. The transform described in Algorithm 10 creates a new dataset. Following we construct a classifier from this dataset using a weighted ensemble of standard classifiers. We include $k$ Nearest Neighbour (where $k$ is set through cross validation), Naive Bayes, C4.5 decision tree, Support Vector Machines with linear and quadratic basis function kernels, Random Forest (with 500 trees), Rotation Forest (with 50 trees) and a Bayesian network. Each classifier is assigned a weight based on the cross validation training accuracy, and new data (after transformation) are classified with a weighted vote. With the exception of $k$-NN, we do not optimise parameter settings for these classifiers via cross validation.